The Den is a theatre, cafe, and studio. We are a space to converse, create, inspire, and relax. Salvete, omnes! Welcome all. We make our home in a spacious loft in the vibrant Wicker Park neighborhood. This comfortable 70-seat performance venue can be easily arranged to accommodate staged readings, lectures, film screenings, and more. 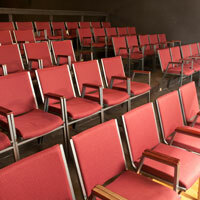 An intimate cafe/lobby is attached to the theatre and rental space is found just around the corner.